If you are looking for that next level sound system for your pad then for a new sound processor then you’ll be hard pressed to find better than a Marantz model. 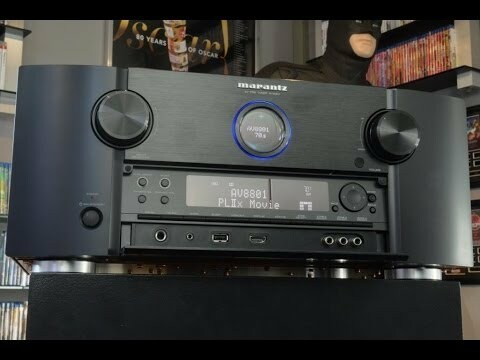 Of course the issue once you settle on a brand is then choosing a model and there are two that stand out to us because of their quality, so we’re going to compare the Marantz av8801 vs av8802. The AV8801 is the older model at around three years of age but that should never deter you when it is of such a high quality! In fact this will likely mean that you can get an even better deal for it. It was once regarded as the ultimate home theater surround sound experience and this model can definitely still hold up against the latest models. So if you are after a system that has an exceptionally high level of performance along with a huge host of features then you will be heard pressed to beat the AV8801! In fact its main competition comes from Marantz’s own updated AV8802…nothing like a bit of sibling rivalry! What the AV8802 offers is some noticeably improved sound quality and thanks to some upgraded specs an even better model than its predecessor. Of course that isn’t to say you need to update your AV8801, it is still an amazing system. But the ante has been upped by Marantz, everything the predecessor had the latest model has either matched or improved on. With technology developing so quickly there are key features in latest models that older models just don’t have, most notably in this instance is the Wi-Fi and Bluetooth options that come with the AV8802. So to conclude, when it comes to comparing the Marantz av8801 vs av8802 it is evident that both these models are well worth investing in as they are amongst the top models of their respective times. But if you are looking for a more modern and up-to-date sound system then you’ll be hard pressed to beat the AV8802. Alternatively the AV8801 still holds up well and is a strong contender for anyone who might be looking to invest in a great quality sound system but it reluctant to spend as much as latest models are asking for.